Not much going on today in regard to GoE, at least not much I can talk about. We’ve got a few really cool new things planned for next week or maybe the week after. But they’re surprises, so I’m not sharing! Yet! I hope you’ve all been enjoying the YouTube version of Fallout: Equestria (The Manehattan Edition). Can you believe we’re already up to Chapter 34? Ever since I set that alarm on my iPhone, I’ve been much better at getting those out consistently. The only time I slipped up I blame entirely on Twilight Sparkle’s Secret Shipfic Folder. A finished version of the WIP “A Panel of Ponies!” Now, since this is a development blog for GoE, I’m not going to post them all here. For that, you’ll want to head over to my deviantArt page. However, I will post a couple! 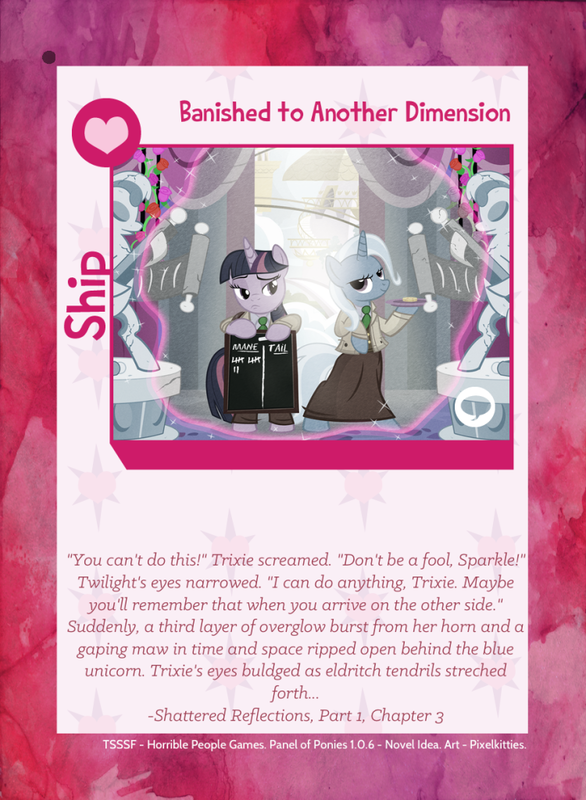 Specifically the ones designed from Pixelkitties’ artwork (who was quite ecstatic about the cards, I’m happy to say). So before we get to the mane event, have some fun! 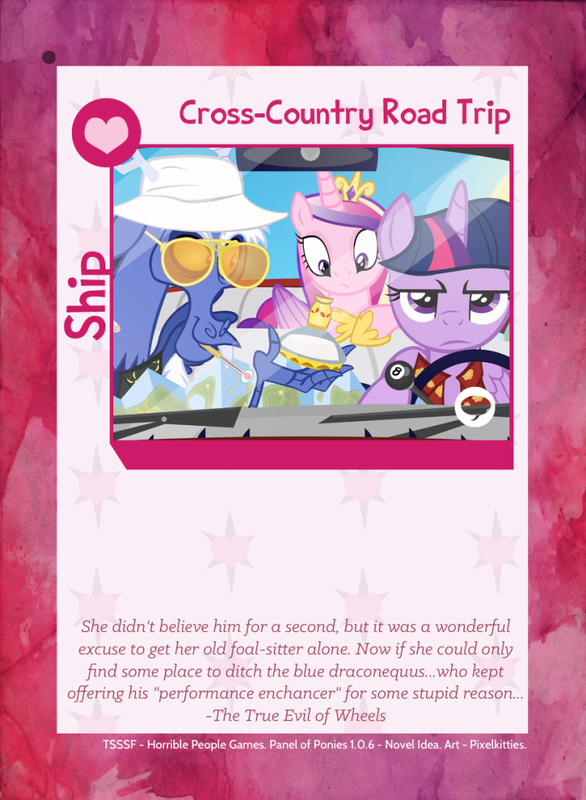 And yes, I know “Banished to Another Dimension” should be about Starswirl kicking the Siren’s tails to the EqG world and “Cross-Country Road Trip” should be Applejack and Rarity on a train, but I don’t care. The pictures were too perfect not to use! Okay. Now, let’s talk Littlepip. I commissioned this gorgeous custom Funko from the one and only PrincessGryph! Now, I’ll admit there was a bit of a delay in getting her, but it doesn’t matter, because she was well worth the wait. I absolutely adore her, from the PipBuck down to the tiny version of Little Macintosh. The detail on the armored barding is pure genius. Anyway, I know this post has a fair bit of fluff, but I’m also deep into the construction of the Rock Farm’s massive Manufactory (which ended up coming out better than I expected) and finalizing the Primm Basement. We’ve also wrapped on several of our voice overs and we’ve got a new scripting technique in place that will hopefully make things run smoother and faster. Anyway, that’s it for this week. If you’re interested in seeing the rest of the “Panel of Ponies” official MLP-based comic expansion for TSSSF, you’ll want to head over to my dA. As for the rest, we’ve always got something fun planned. So we’ll see you next week! Special Announcement: Completed & Reformatted Fallout: Equestria Project Horizons eBook Now Available! Manehattan Update #36: Exclusive Reveal of Appleloosa Valley Map!